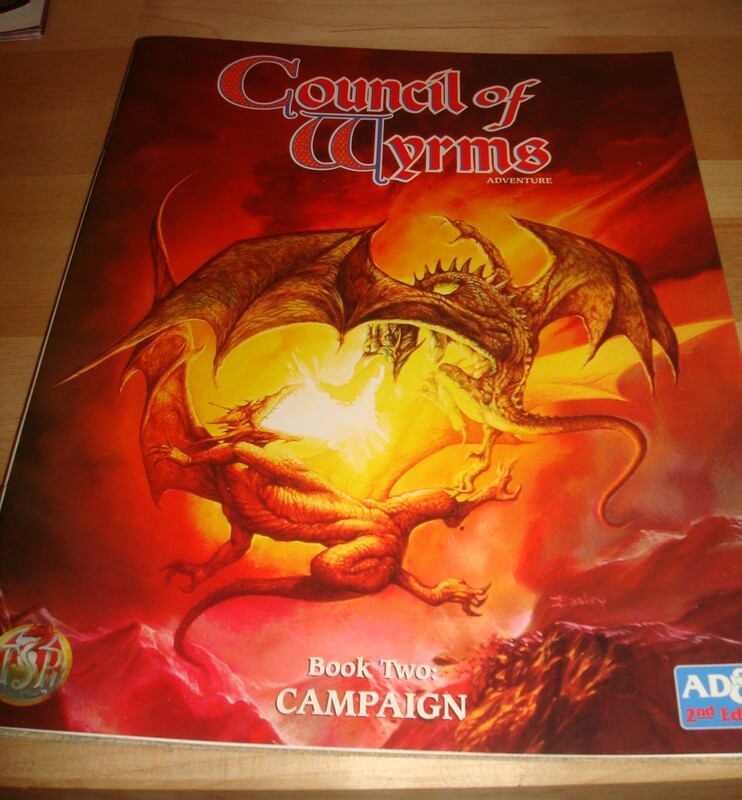 The Council of Wyrms boxed set was released in 1994 by TSR for the 2nd Ed. 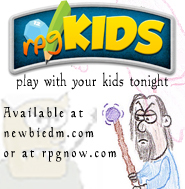 AD&D game. It was written by current head of RPG’s at Wizards of the Coast, Bill Slavicsek. 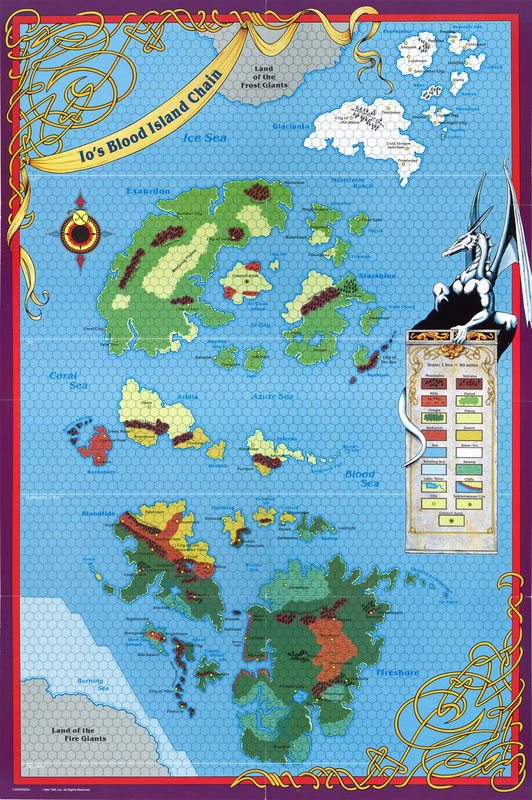 The setting is unique in that for the first time in AD&D it allowed for player characters to play Dragons. One could also play Kindred (demi-human servants of the dragons), and Half-Dragon characters. The boxed set takes place in “Io’s Blood Island Chain”, a set of islands that encompass all different climates types, and are separated from the other parts of the world by a large ocean. The story has the islands being created by Io’s blood dropping on the ocean, and forming the islands once it cooled. 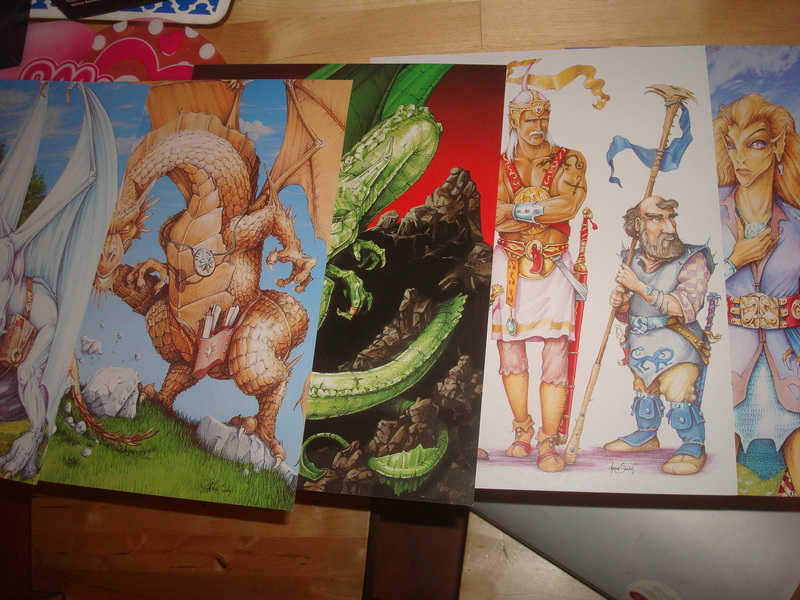 The three books have cover art by Jeff Easley, one of the iconic illustrators for the 2nd Edition of the game. His cover art really captures Dragons in all their majesty here, and instantly set the tone for this campaign setting. 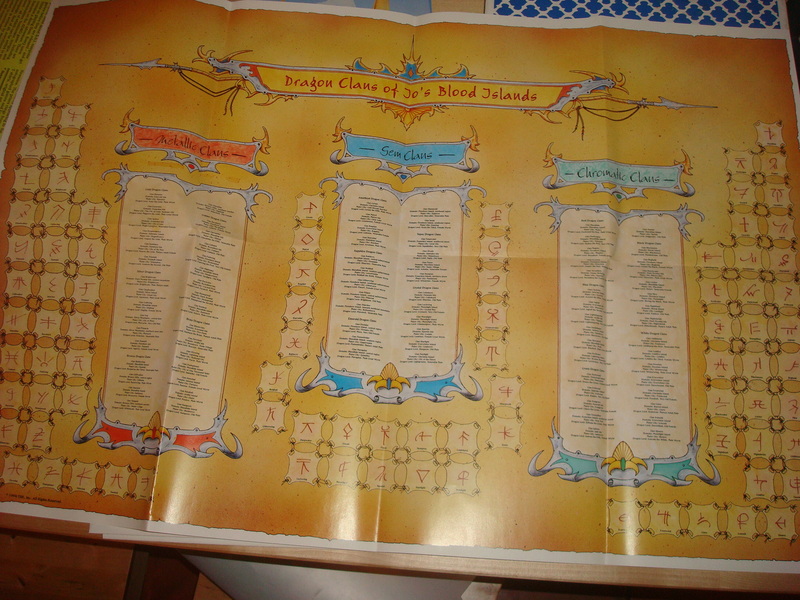 The books all have black and white artwork in the interior, with a bit of color being given to some fonts and borders in the pages. The interior artwork is credited to Arnie Swekel and Glen Angus (inks). 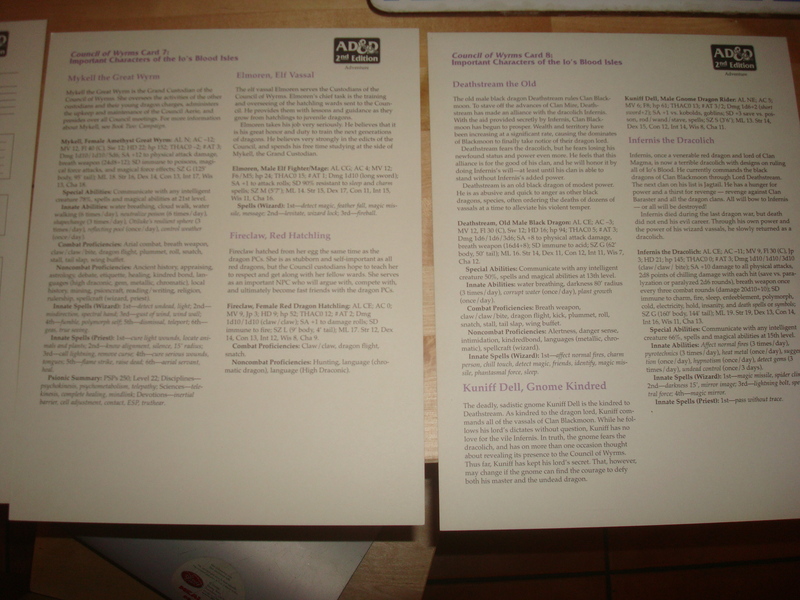 The first rulebook covers the actual crunchy bits of the 2nd Edition. 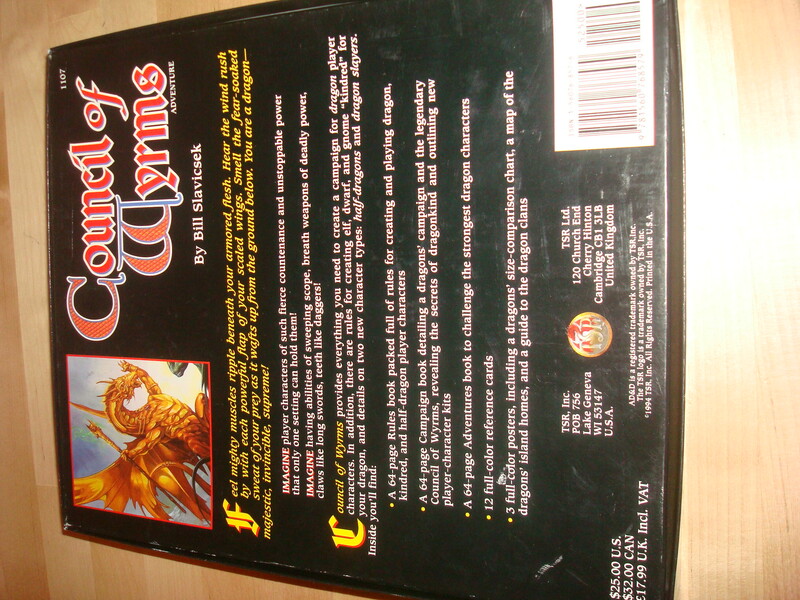 Things like character creation and draconic combat are covered here. It also introduces proficiencies suitable for dragons. The second book, the campaign one, introduces all the fluff around the islands. All the major npc’s as well as draconic culture is covered here, along with details on how best to use the setting in a campaign, whether new or ongoing. The book covers such things as mating, religion, dragons and magic, and aging and death. There’s tons of material here to use (at least fluff wise) even if you aren’t running a 2e game, and want to experiment with using dragons more in your game, or are simply looking for an alternate dragon lore to use in your games rather than what 4e has been giving you. 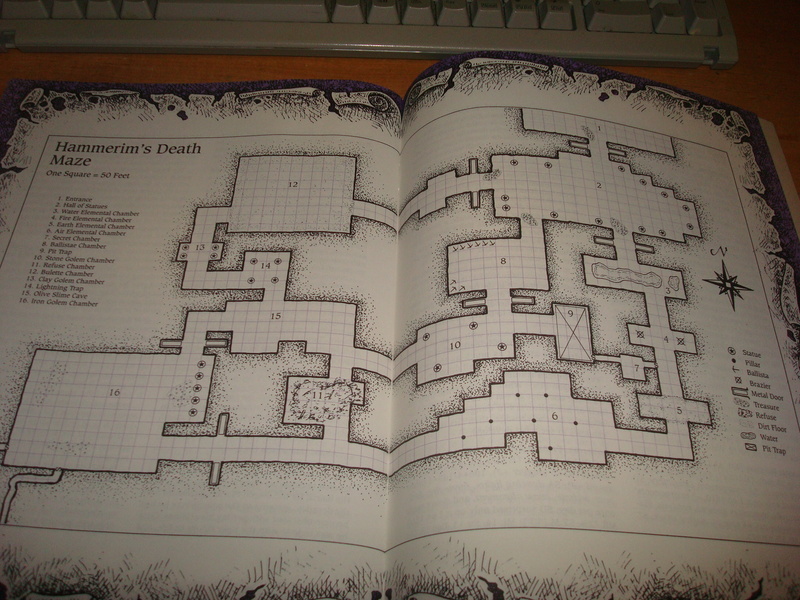 The third book provides the DM with adventures to use for the setting. 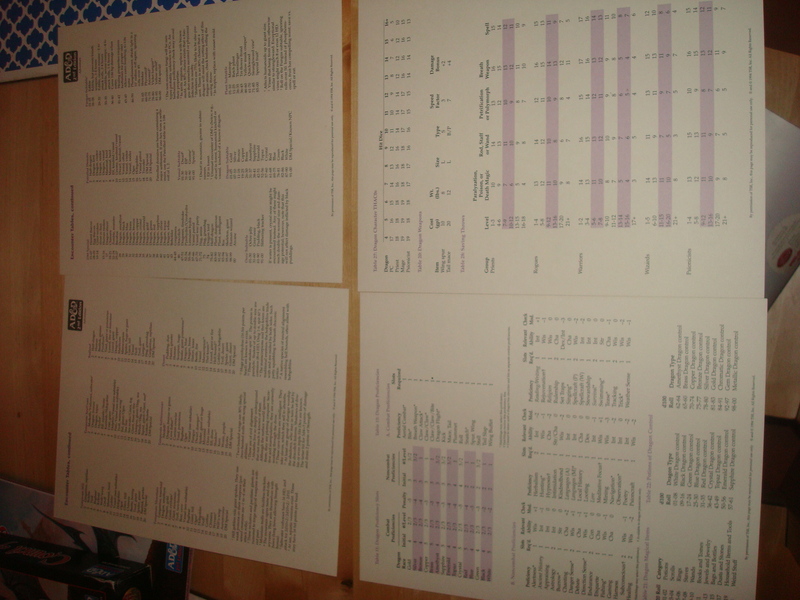 There are four adventures, for level ranges 1-6. One thing I really like about this book is the encounter maps. They aren’t battlemaps, but they are good enough to provide some semblance of where you are and what’s around you to aid in the abstract nature of 2e combat. What kind of adventures do dragon pc’s go in? Well, an example adventure has to do with the pc’s saving a young white dragon from a village of dwarves looking to kill it in order to protect a secret. 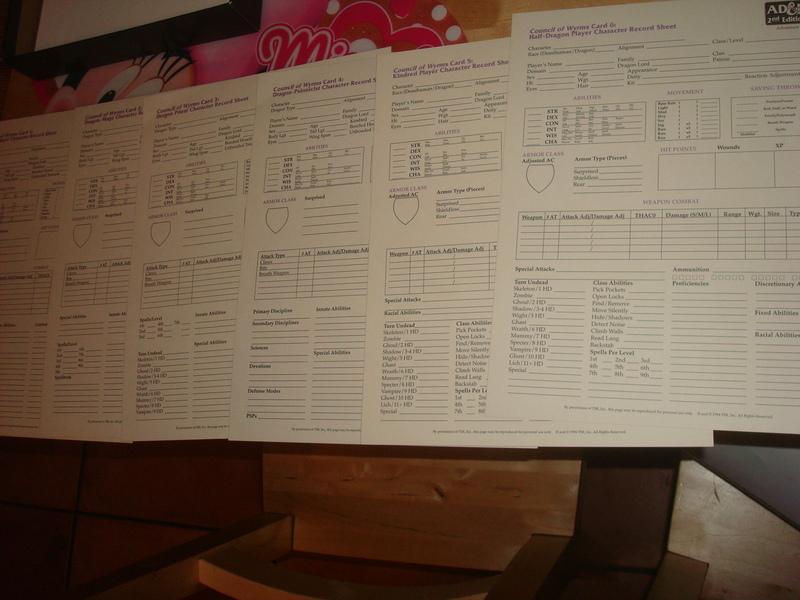 Also included in the box are twelve cardstock color cards with artwork, character sheets, important pc’s, and reference tables for running the game. 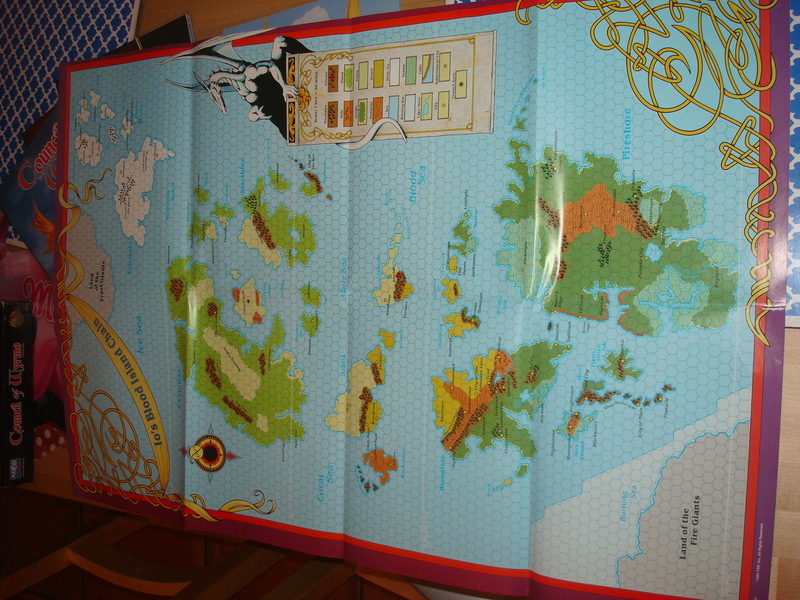 My favorite part of this boxed set though, is the poster map of the islands. This map is a pretty neat hex map, and I can see me using it for a possible homebrew somewhere down the line. Check it out below, although there is a great map online of the islands. And that’s what’s inside the Council of Wyrms boxed set. 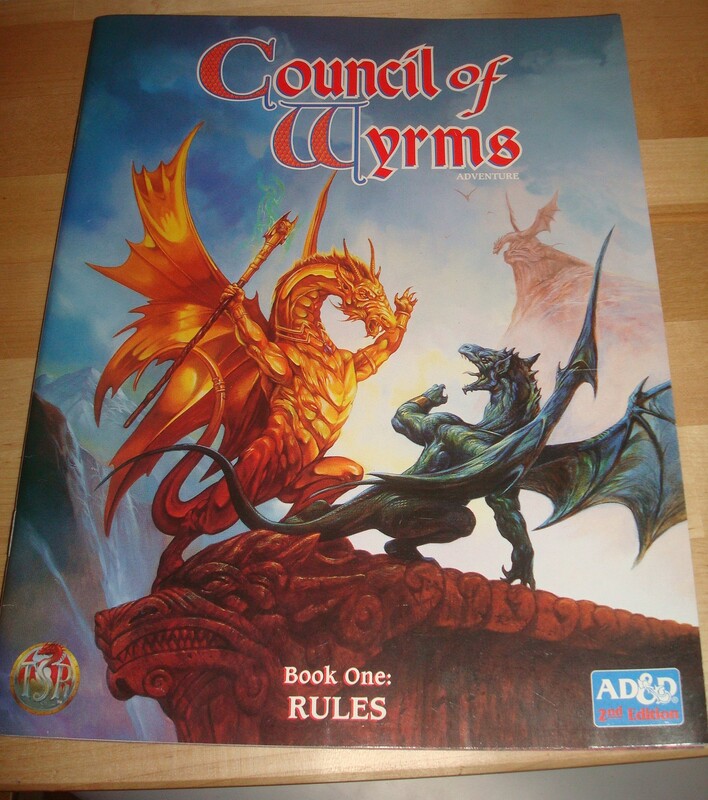 I don’t remember this being all that popular amongst my gaming circles back in the day, and I know that I never played in a Council of Wyrms campaign, but there certainly is enough material in this box to get something out of it for your current games. If there’s one thing that 2e had, it was plenty of campaign settings and locations. There’s nothing keeping you new DM’s out there to look beyond what’s currently being offered as campaign settings for your games and reach into the past for ideas and suggestions. And that’s the point of this “Classics Unboxed” series, to show you other avenues of inspiration. 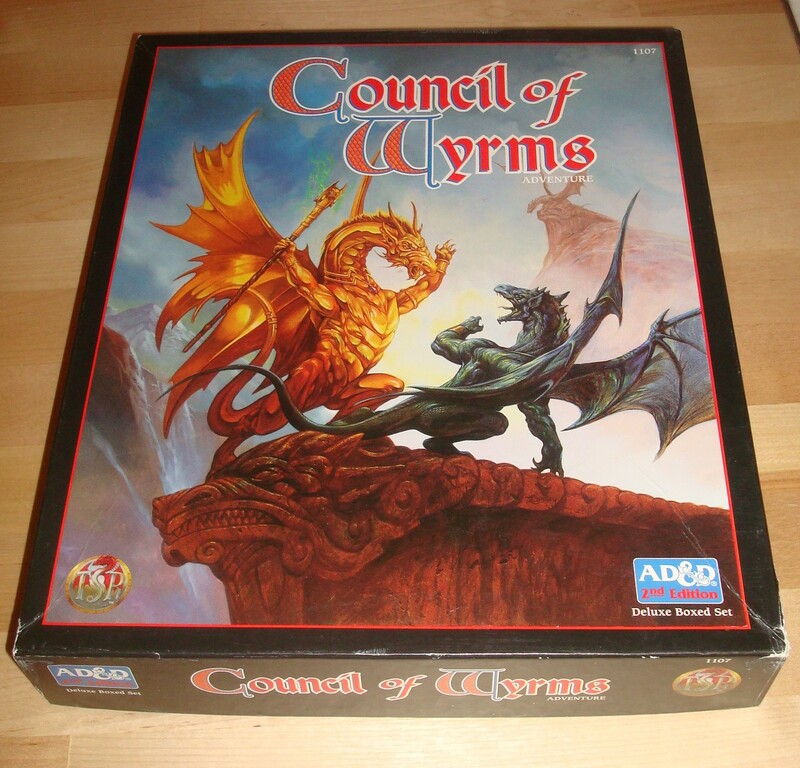 You can find Council of Wyrms on eBay from about $10 to about $25. I ended up selling the box to a friend- let’s call him Rick- who was obsessed over the setting and a really big dragon buff. He tried a couple times to run campaigns of it but they never took hold. Whether that was the setting or his DMing skills I can’t say for sure. This is too weird – I was just thinking of this boxed set for the first time in years a few days ago after watching ‘How to Train a Dragon’ with my son. I remember my friends and I gathering around the boxed set and thinking it was so cool – “we’re gonna be dragons.” Spent the day making dragon characters but then realized at some point that none of us had the first clue about what kind of adventure to run when we could scarcely play a functional game with regular 2nd edition material. Fyi, I vote for either Birthright Campaign next (Civilization+DnD… what could go wrong!) or Elminster’s Ecologies (boxed sets could jump the shark too). 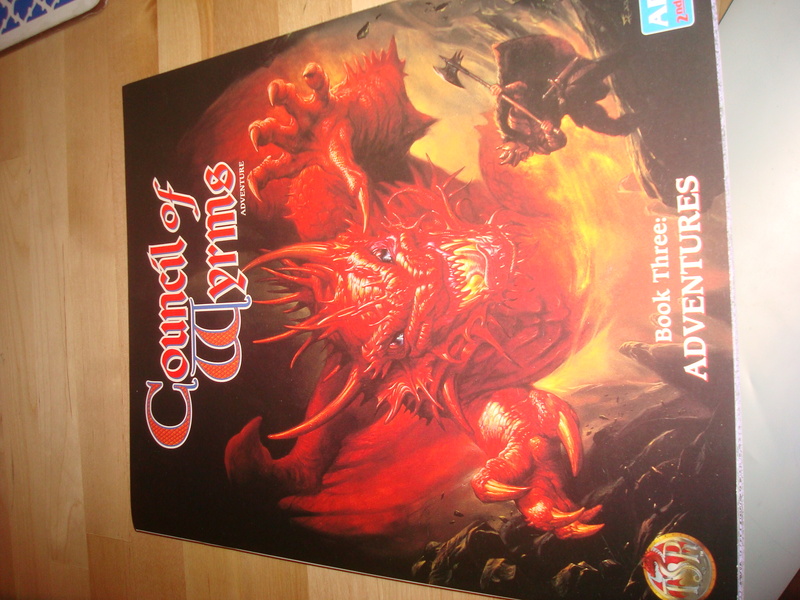 Oh man…I actually had -two- copies of this boxed set; I think one of my players in my regular campaign destroyed the first one, but this was so long ago it was possible to pick up a spare and they refurbished me. The biggest problem with the game was that dragon advancement consisted of necessary Xp, Treasure (to sleep on in your hoard as you grew to the next level, which also bound you to the treasure), and Time. You were actually bound by the passage of years when developing your character, and had to be as old as the next age category to grab the next level. Obviously this presented some conceptual difficulties in running a consistent campaign, and the books more or less ordered you to make additional demihuman or human characters (perhaps from the same bloodline but certainly from your dragon’s clan) and play them in between sessions with the dragon. Of course, trying to convince a 14-year-old that he needs to put down Malshash the vicious red dragon and pick up Ted the dwarf was…a hard sell. Equally difficult was the scale and impetus necessary for the dragon campaigns themselves; hundreds of goblins weren’t much of a challenge for a dragon with two or three levels under his belt, and the intro-intro adventure in the book had you playing hatchlings against a tribe of ogres. If you played one of the dragons with polymorph it was a little easier to fit them into a campaign, but then there was the constant temptation to “hulk out” for any challenge. The half-dragon rules presented in the box probably saw the most play, because those were exciting and exotic races that could be ported into regular campaigns. One of my players greatly enjoyed running a half-gold firemage, and in my longest running campaign the party cleric started as a half-silver (which I eventually built into an evolutionary-style class for him, so he could amass cooler draconic traits). I wonder how Council would play out now…it seems that the game has picked up enough theoretical innovations in encounter construction and power limitation that it might be a bit more palatable, and the tactical nature of the game’s combat could make fights a bit more comprehensible. I played in one of the adventures run by Rick that Dave mentions above, and I was thrilled to get a chance to play a dragon. For whatever reason the Sapphire Dragons were my favorite back then, possibly because they had a sonic cone breath weapon. The adventure unfortunately got completely derailed when one of our players was playing a Black Dragon and decided he wanted to be completely and totally evil, refused to go along or help on our quests, he probably even actively tried to sabotage our quests, and the adventure was ruined when we all just turned on him and killed him (because Black Dragons weren’t as strong as most others, if I remember correctly). Ha, I remember having this box set but never playing it. 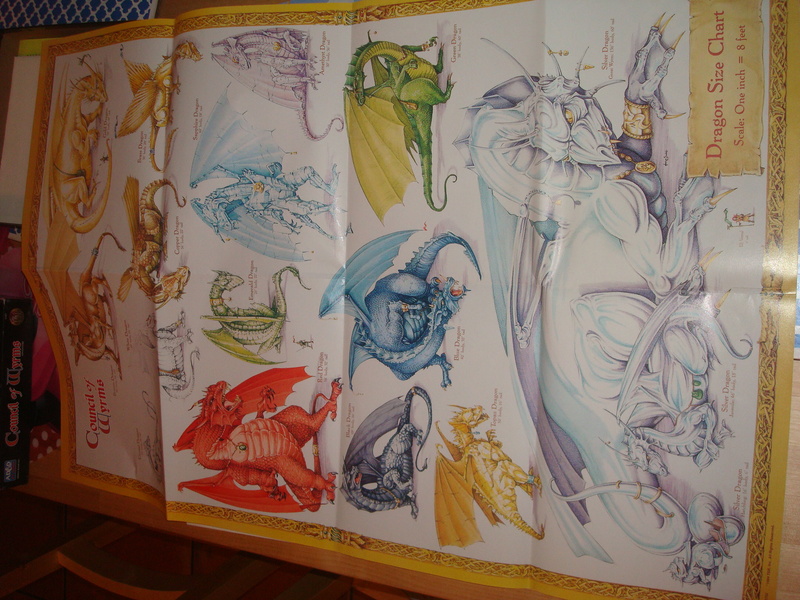 Loved the poster with all the dragons on it. I can’t even begin to remember what I did with it. Love these “Classics Unboxed” posts. Keep ’em coming! What I did use it for though, was making some really cool Dragon NPCs. It is great to see this unboxing. I’m still deciding which of the two versions of CoW is best.